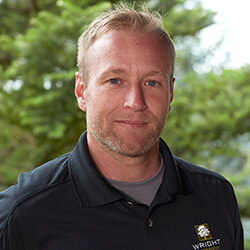 Account Manager Ryan Burlingame started with Wright Tree Care in 1997 and helped lead the department through the company’s merger with Heard Gardens to form Wright Outdoor Solutions. His appreciation of the outdoors and hardworking approach has led to a reputation of being trustworthy and knowledgeable. Clients appreciate Ryan’s dedication to their projects. He is an International Society of Arboriculture Certified Arborist and a Certified Applicator with the Iowa Pesticide Bureau. Ryan’s favorite tree is a burr oak; it is also his favorite tree to climb!